I would like to create a statement to follow and include it in my IPS. If you have written such an IPS statement on market declines and would be willing to share that statement, I would appreciate it. I hope everyone is enjoying their Friday and looking forward to an adventurous weekend! #3. Set it and forget it. That eliminates human emotions as a risk factor in your portfolio. Once per year in early January we look at our 40/60 port. If stocks are more than 42% of port (up 5%) we sell stocks and buy bonds. If stocks are less than 38% of port (down 5%) we sell bonds and buy stocks. On average we rebalance every 3 years. I went with what was behind door #3. My IRA money was in a T. Rowe Price target date fund which took a big hit because they believed in a higher equity ratio than most other target date funds. I thought it would be a big mistake to make any changes at the time and that proved to be correct as it recovered very quickly. It did cause me to re-think and change my strategy however. I now control my own asset allocations instead of depending on somebody else to do it. Last edited by jacksonm on Fri Nov 09, 2018 2:05 pm, edited 1 time in total. Read that whole thread. You'll be transported in space and time. I confess that I do not recall the last significant stock market decline (-25%) we experienced (maybe 2007?). You don't recall the -50% decline of the Great Recession in 2009, the worst since 1929? Early signs of dementia kicking in ... seriously, I just did not recall the date. I appreciate your homework on the exact year. Excellent. Thank you! This will be better than relying on individuals' recall of what they did. My wife and I were really scared. We did nothing at all. I wouldn't call it a "strategy." I will mildly counter that a yearly calendar rebalance is better. The fewer times you peak the less you will freak. Quarterly works as well. Anything beyond that and you are hitting the marginal returns of a rebalance strategy. Honestly, from a pragmatic viewpoint it does not make a huge amount of difference between #1 and #2. Pick the one that is easiest for you to execute. Doing nothing at all, in the face of fear, sounds like a brilliant strategy! if your money is in a 401k they will not allow you to rebalance as much as you may want. If you try trading once a month they will probably slap on 90-day holding penalty if you try to trade frequently. Ditto. Felt afraid. Did not look at 401(k) statements for almost a year. Did not “back up the truck” or “buy stocks on sale!” like many on this site seem to brag they did. Automatic investments went in as scheduled though and we never sold anything. I confess that I do not recall the last significant stock market decline (-25%) we experienced (maybe 2007?). I would like to hear some strategies used by people during the decline in attempts to maintain their asset allocation. I ignored the market and went to the beach. Literally. Kept investing in my 401k and didn't think about it. I was young(er) with a large emergency fund and very low expenses, so I threw everything I could into the market at 100% equity allocation. The memory of 2008-2009 is why I keep a large cash emergency fund, and live well below my means. That allowed me to continue investing even when my job was uncertain. Extending on what I am reading ... so it seems that most did nothing during declines. Does that mean that you are not concerned about having a percentage of equities in your asset allocation? Just let equities go where they may. If they declined below 25% of your overall portfolio, would you just let it drop with the knowledge that someday they will rise back up? I like the thinking around doing nothing, but the idea of an asset allocation as part of my IPS has been central to my thinking. Thanks for the provocative discussion. he fewer times you peak the less you will freak. 50% of my portfolio was in the Vanguard Lifestrategy Moderate Growth Fund (60/40). The other 50% was in the Wellington Fund (65/35). They rebalanced themselves every day. I thought of it as "taxes were on sale". When we did the last conversion when the markets were down 50%, that was like paying only half the tax you normally would have paid (or you could convert twice as many shares for the originally-planned taxes). Even though our tax bill was a little higher than usual that year, I thought the "sale" was well worth it. I would do it again (if we still had something left to convert). I did no moving or changing of anything..I was still in the work force, so still had regular payroll contributions that were buying per my allocation at that time. All around me, my co-workers were getting out and realizing their losses. Years later a few of us talked about our actions back then..heard some interesting things and a lot of remorse. It certainly could have turned out differently. With regards to the portion of your post I colored, My feeling were then, and is now, that our countries business sector will always rebound, albeit we don't know the time period it may take. Having retired early at age 55 in 2005, I was stunned by the losses, and was wondering if the pension would fail. Finally rebalanced long after the recovery was obvious. If I didn't do as well as most, that is still okay, since we still have enough for us. These days, I'm pleased about the lessons learned from that first crash in retirement. +1 We had no real strategy. This was pre-Bogleheads, 2000 and 2008. Lost a huge amount in 401K's and IRA's, the wife works for a small employer and they could no longer afford to offer 401K's and health insurance. I also watched as 100's of coworkers were let go. The point is, to make a solid plan that you can stick with during difficult times. I did no moving or changing of anything..I was still in the work force, so still had regular payroll contributions that were buying per my allocation at that time. Same here. My 403B contributions were always split 50/50 between a stock fund and a stable-value fund (TIAA Traditional); between that and my ongoing contributions, my account balance dropped by "only" 17% between June 2008 and March 2009. It was before I found this forum, so I didn't even rebalance, but simply let the stock fund recover naturally. At the beginning of 2010 the account was above its June 2008 level. A lot depends on if you are in the accumulation stage or close to or in retirement. When I was in the accumulation stage I didn't like market declines but basically took no actions except maybe some rebalancing. In the 2008 major decline I was 60 and was suddenly forced to retire. I was forced more into an asset preservation mode so I moved my TIRA from my employer to VG and held it in a Money Market Fund for awhile. Some other taxable assets were placed in CDs. Overall I probably dropped from 55% equities to 18%. When the market started to recover I DCA'd a substantial amount each month and doubled that when any month had a decline. I eventually got back to a more normal equity allocation. I went from having enough to fund my retirement to below that number. Facing say 30 years of retirement and zero human capital (no jobs were available at all) and the dry up of house sales was a major challenge that resulted in me having to rip up the script of how I handled my investments. Now in retirement and having assets well above my number and income that almost covers my normal expenses I look at market declines as a possible chance to buy some equities as long as I stay within my equity range of 40-43%. During the recent market declines I added a bit to my equities in my Roth and TIRA because I can afford to take a bit more risk but don't need to. I think an IPS is a good idea but it is hard to set a plan that tries to cover decades of investments and events that can occur in the economy or in your personal life. Lots of variables and challenges. You probably need to rethink your IPS several times during you life rather than set it and forget it. We upped our percentage in our employer's 401k plan. I guess you're both sorta right. The Great Recession started December 2007 and ended June 2009. Mind you the stock market doesn't exactly follow recessions in that the bottom of the Market (that 50% decline you speak of) was reached on March 5, 2009 (but the recession didn't end until June of that year). I do think it's interesting that since so much time has passed some people have forgotten what it was truly like. Others however, are still scarred by that time period. I suppose it depends on how badly it affected you. If you lost your good paying job and didn't find another one since (or it took you a year or longer) or you lost your house, etc. the sting of that recession lingers. If you sold stock in a panic and didn't get back in and missed the runup, that might linger. Just heard a stat about millenials not being invested in the stock market. It's around 3 in 5 (that's 60% not invested ). Some of them might not be getting paid enough but others were so scarred by their early losses 10 years ago that they got out and haven't gotten back in. it was ~50%. and 2009.
kept bands. not perfect, but moved every few months maybe. kept buying stocks. didnt need to add bonds for months. Certainly not universally true, probably not even common. Megacorp had no restrictions on selling automatic contribution purchases. It also allowed you to rebalance to the defined percentages with a single click. Even selling specific purchases only mattered if you sold the specific shares you'd bought. Selling older ones didn't matter. They just didn't want you speculating by jumping in and out of funds. My wife's mega corp (which is our 401k), has limitations on fund trading. Can definitely exchange funds 3-4 x a year, but anymore then that they will limit exchanges. I have two rebalancing bands, a soft and a hard, but I've made it a habit not to look at my portfolio too much, so only make the rebalancing calculations a couple times a years. The soft threshold, which is not wide, is where I turn on dividend redirection, i.e. stock dividends automatically get reinvested into bonds or vice versa. I've found that between dividend redirection and investments of fresh savings into whatever is lagging that that takes care of keeping the portfolio near enough to my desired allocations in normal times---at least what passes for normal since I started investing in the 80s. My much wider hard rebalancing threshold where I will sell investments has rarely been breached. The financial crisis of 2008 was not normal times. Stock losses were deep enough for long enough that by early 2009 my hard band had been breached, and I held my breath and followed my plan: sold what seemed like a lot of bonds and, along with some fresh lumpy money that sometimes comes in the beginning of the year, bought stocks back up to my desired allocation. I thought about Bill Bernstein's idea of over-rebalancing and boldly buying even more stocks, but decided not to do that. It may sound like I was cool, calm, and calculating during the crisis. Why? My job was never threatened by the financial crisis and its stock market losses. That easily permitted a veneer of calmness, and I think that's a big factor in staying sanguine through large losses. If you, happy youth, are looking forward to your first bear market decline and your job is likely to be in danger during the exercise, I urge you to account for that in deciding your risk tolerance. As I'm recently retired, I get to now look forward to my first large market decline without having fresh work earnings to use to rebalance. I wonder if I'll be as sanguine the next time. As I have no experience, I'll just have to wait and see, hoping that I've gauged my lower risk retirement portfolio allocation reasonably correctly. I was early retired when the downturn hit. Thanks to the help of many here my strategy became to tax loss harvest and rebalance from bonds to stocks a couple of times - not strictly based on bands but rather when I could mentally bring myself to do so. I also took advantage of the opportunity to simplify and rationalize my funds considerably and develop a plan for the future. It was a very scary time and I couldn't bring myself to rebalance all the way back to my pre-crash 60/40 allocation. I took that as a sign that my risk tolerance wasn't as high as I thought it was and have stayed at 50/50 ever since. Everything turned out very well. I was able to capitalize on the situation and am in a much better financial position than I would have been without the downturn and the help of Bogleheads. Final few months of 2008 were painful to my investments, stopped adding to accounts, let cash build,,,,, in mid Jan 09 started buying, in Feb stepped on the gas investing (equities, HY bond funds and loan funds).....this was pre boglehead for me,,,,,worked out well but was stressful. Post my Bogle heads adoption, In a severe sell off (say 25*30%+) I suspect I would maintain my monthly adds to various accounts ( taxable, 529, wife's 457) vs terminating them for a period as I did in 4Q08...also likely adjust those monthly adds to 100% equity from current split. And at some point 'find' money to add above that. Primary difference is not ending monthly additions. May not be 100% Boglehead but it is a shift in my approach thanks to Bogleheads...among many other changes I have made,,,,most important, making low cost index fund the dominant positions by far in my accounts. Previously had many individual stocks. Wife + I are in 2 balanced funds + TIPS Fund. Yes I was terrified. Let funds reinvest dividends + prayed.LOL. My bond allocation was 10% at the time, with a tolerance of 7.5%-12.5%. I hit the band limit in October 2008; and sold some bonds to buy more stock. I continued to put new money into bonds at the regular rate during the recovery, which prevented me from needing to rebalance out of stock into bonds during the recovery. I did have to rebalance out of REITs in September 2009 because they recovered so fast. The next time I rebalanced between stock and bonds was December 2010, when i sold some stock to buy more bonds as part of my 2011 annual rebalance. Here is what my IPS says about rebalancing; this part of the IPS has not been changed for years. I make a distinction between a "major asset class" such as bonds, and a "subclass" such as small-cap developed-markets stocks; the 25% rule is not appropriate for a subclass which is only 10% of my portfolio, particularly given the volatility of some subclasses. I will do a full rebalance annually, when I make my annual IRA contribution. 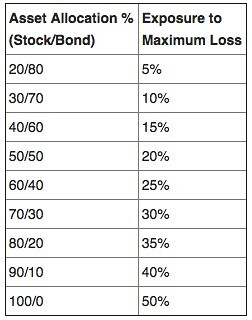 I will pay capital gains tax to rebalance in a taxable account only if a major asset class or subclass would otherwise be off by more than 5% of my total allocation, or a major asset class would be off by more than 25% of its own target allocation, and I do not expect that normal inflows will fix that allocation problem. I will rebalance tax-deferred accounts freely to get as close as possible to the target allocation. Whenever I invest new money, I will check my allocation and invest the new money in order to get closer to the target. I will not rebalance at that time unless a major asset class is off by more than 5% of my total allocation, or more than 25% of its target, or a subclass is off by more than 5% of my total allocation. Because I direct new money properly (for example, since I am underweighted in international, new taxable investments go to international funds), I have never had to sell for a capital gain to rebalance. I came close in 2007; one more year of similar returns would have forced me to sell some Emerging Markets Index for a capital gain. For example, in January 2015, I decided to change my asset allocation (for reasons unrelated to the market; I started to decrease my stock allocation every year as retirement gets closer). I wrote that in the IPS in January, but waited until April to make the switch. In contrast, in November 2013, I bought a condo. That was a substantial change in my financial situation, as it increased my housing costs for the next fifteen years and decreased them after that. Therefore, I changed my asset allocation at the same time. "Rebalance when allocations to broad asset classes are 5% points from targets." "Max out retirement plans and Roth IRA's until retirement." Actual savings rate vs. target savings rate. Tax efficiency of the taxable accounts. Tax loss harvesting opportunities in taxable accounts. Thinking back to the financial crisis, I enjoyed coaching Little League Baseball and racing bikes so much during the 2007-2009 that it literally took my mind off of it as we continued to contribute on a monthly basis to our retirement plans. We were so involved with parenting that the financial crisis and portfolio swoon was over before we knew it. Sure, the concern was felt at the time and the general mood of colleagues and friends in that downturn was morose, but we kept on enjoying our lives in spite of it thanks to everything being in color and no dust (compared to images of the depression in the 30's). This year, as the rolling correction/bear market in many individual equities and countries continues, we continue to enjoy riding our bikes as we are still contributing and accumulating as we pass some of the time and will do so as yet another eventual recession comes at some point in the future. Put us in a mix of #'s 3 and 4 in spite of our investment accounts being much higher now than they were in the 2007-2009 swoon. The S&P 500 trades within 5% of a record high about 60% of the time, and within 10% of an all-time high about 74% of the time, based on monthly returns since 1960. Corrections (10% + drops) tend to be short-lived, and undo only a few months of S&P 500 returns, so waiting for one requires superhuman timing. Bear markets (20%+ drops) are more destructive—giving investors a 'time machine' to invest at prices last available years ago—but they are also incredibly rare. The S&P 500 spends only 12% of the time more than 20% below its last all-time high, and these episodes are years apart from one another. What to do? Count the days to fill one's time? Add in the 12 month nearly 20% swoon (and underlying bear market in many stocks) from mid 2015-2016 to the above chart. What to do? 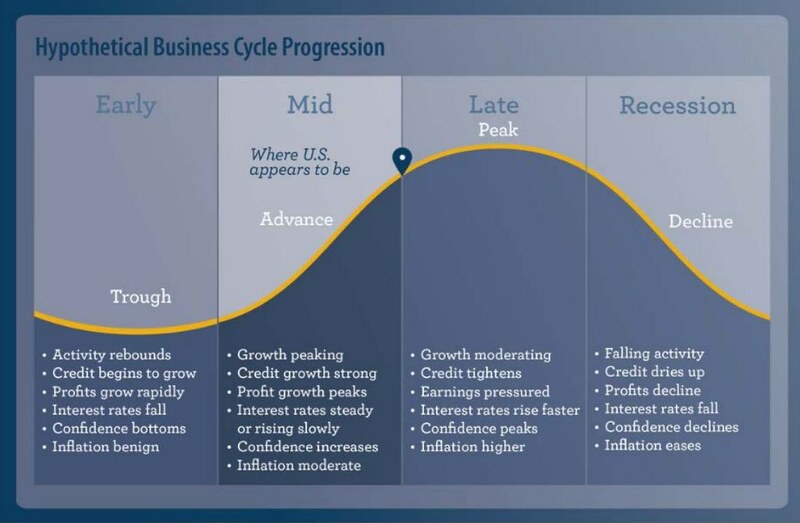 Follow the roller coaster of the business cycle as much as we do the weather? The above graphic is from earlier this year. What to do? Compare our stats of our Asset Allocation to a typical 50% correction? 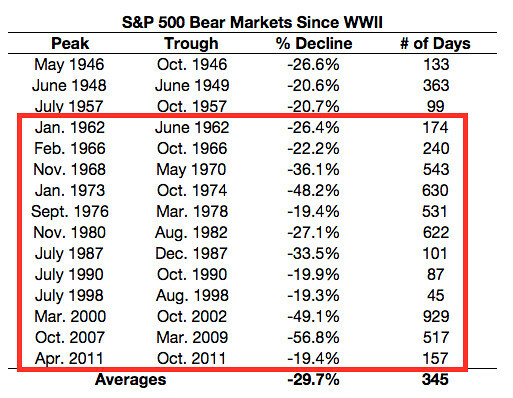 Credit to Larry Swenson for this graphic of the 48.2% drop in the 1973-74 bear market. What to do? Keep a score sheet on predictions by gurus of how much of a correction/bear market we will have? What to do? Study the length of corrections and follow Yardeni Research for bull & bear markets? Corrections and significant market declines are part of everyone's investing journey - as are uptrends and significant bull advances. Sentiment and the business cycle swoons and ascends many times throughout our investing journeys. You are doing the right thing by collecting your thoughts on paper - or digital paper at least - for your IPS. That should help you stay the course and meet your long term goals. brought out my soul (my in-retirement income soul), and for many others here as well over the years. Even though I live off of my savings and SS only, I will be comfortable with a 50% 60% or whatever percent stock market bust this time because or what I learned during that time. Were you employed or retired? Why doing nothing is NOT a strategy? It is a VERY VALID strategy. That's a fantastic chart, thanks for sharing. I would have to say that he 2008/2009 drawdown seems much easier to tolerate from today's point of view. 500 days is much shorter than the 900+ days from from the 2000-2002, which seems quite painful. I lived through both of those, with not much in assets (well not compared to current day), and somehow, the 2008/2009 seemed much worse. Perhaps it was the feeling that money stored in banks, FDIC insured, could also have been lost. I know, I know: most people would say: don't worry about losing FDIC insured deposits. I disagree. In a real crisis, that too shall be questioned. Keep your money spread across many banks. Also, something else to learn from that table: the current bull market is quite long: approaching 10 years. The slow-growth of 2009-2016 is perhaps the key reason for that. People are asking for 4%, 5% GDP growth, touting that as a good thing. Meanwhile, slow and steady wins the race. Sounds like our dinner table. I kept saying, don’t look and we didn’t for the most part. We held tight and it is now a distant memory. I got burned in the .com crash (a little) by actively trying to play the market. I was chastened and that memory is still more raw. A yearly rebalance is a sound way to not look. I have been TLH taxable this year so I am looking often and the temptations are strong to fiddle. So far we’ve kept the allocations steady and it is interesting to watch how they diverge then realign in a choppy market. Reminds me I need to to have a longer horizon at all times. Respectfully, sounds like you may have selected the wrong target date fund to put your $$ into. Should have selected one w/ a retirement date 5-10 years sooner (?) for a higher bond allocation.